Identification: Gray-brown to black, hard-shelled weevils with long, slender beaks. The most characteristic feature is the two spurs on the upper part of the front legs. Biology and Life Cycle: Complete metamorphosis. Generation every twenty-five days. Overwinter in the adult stage. Habitat: Cotton fields. Overwinter in all kinds of shelter, in trees, under bark, in trash, in fence rows, and under leaves. Feeding Habits: Feed almost exclusively on cotton. They puncture the squares and bolls with their beaks to feed and lay eggs. The larvae then completely ruin the squares and bolls. Economic Importance: The most notorious pest in the world, causing enormous financial losses. Makes the manufacture of chemical pesticide very profitable. Natural Control: Catolaccus wasps and some braconid wasps, cultural practices, soil building, and establishing beneficial insect populations. Organic Control: Garlic spray, neem, pepper spray, catolaccus wasps, and beneficial fungi products such as those that contain Beauveria bassiana. Insight: Cotton is being grown organically by some fifty growers, producing over 20,000 acres over the state of Texas. These pioneering cotton farmers are successful and profitable. If just a small percentage of the research money was spent on studying organic control methods, all cotton could be grown without the use of poisons. 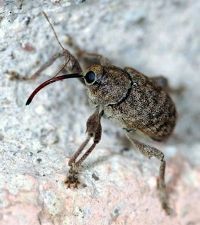 Instead of working with these organic growers and helping them, the USDA and Texas Department of Agriculture tried a boll weevil eradication program using broad-spectrum insecticides such as malathion to spray the southern United States. By late 1995 it had already proved disastrous. On the Mexico side of the Rio Grande, the Mexican farmers with no eradication program harvested more than 500 pounds of lint per acre while just across the river on the U.S. side, which had the same soil, rainfall, and other growing conditions, the cotton was destroyed by other troublesome insects that were normally held in check by beneficial predator and parasitic insects. The beneficial insects had been destroyed by the spraying program.